BRT done well offers the potential of metro-like levels of capacity, passenger service and speed at a fraction of the cost of metro systems. BRT also has a much faster implementation time frame and can rapidly provide a citywide reach, since BRT buses can enter and leave the BRT corridor. BRT done poorly provides none of these benefits. 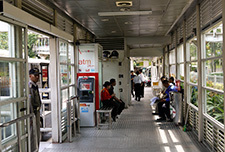 Unfortunately most BRT systems in Asia perform below expectations, and many are outright failures which likely provide no net benefit to either public transport passengers or other road users. The genesis of a failed or poorly performing BRT system can usually be traced back to errors made during the conceptual and preliminary planning stages which are propagated through the later stages of the project. This article explains how BRT projects can go wrong, and some steps that can be taken to mitigate risks, especially during the critical earlier planning stages of a BRT project. Infrastructure risks are the most serious, because it is often difficult or impossible to fix these problems short of demolishing the system. Bogota Mayor Enrique Penalosa, who implemented the Transmilenio BRT system in 2000, likes to comment that BRT is like heart surgery for a city, and that when undertaking heart surgery one should be sure to look for a surgeon with a successful track record. Just as a vague or poorly conceived preliminary BRT plan is a high-risk proposition because it sets a project up for failure (though fortunately the more likely outcome is that it is never implemented), a solid BRT plan is low-risk because it provides the foundations for a successful project. Excellent planning and design of the Transmilenio BRT system, which radically transformed public transport in Bogota, ensured a successful project outcome. There are many areas where BRT projects can and do go wrong, almost all of which can be heavily influenced by the preliminary and conceptual design stages. 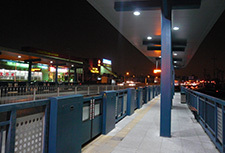 These include project set-up, BRT stations (configuration, dimensions, architecture, signage & identity, spacing), BRT roadways and intersections, technical supervision of implementation, demand analysis & modeling, operational design & fleet requirements, costings, communications & outreach, ITS elements, modal integration, station area development, regulation & institutions, traffic management during construction, supervision of construction, and BRT station access planning. In the early stages of any BRT project it is necessary to assess and, assuming there are benefits, promote the benefits of BRT. However, just labelling a project as 'BRT' does not by itself mean that it benefits public transport or has any overall net benefit for the city. 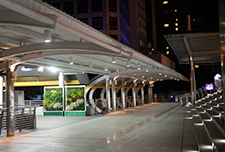 Following is a list of benefits from a well-planned and well-designed BRT project that materialize as disbenefits in a poorly planned and designed project. More credibility Less credibility. Possibly sued by operators. 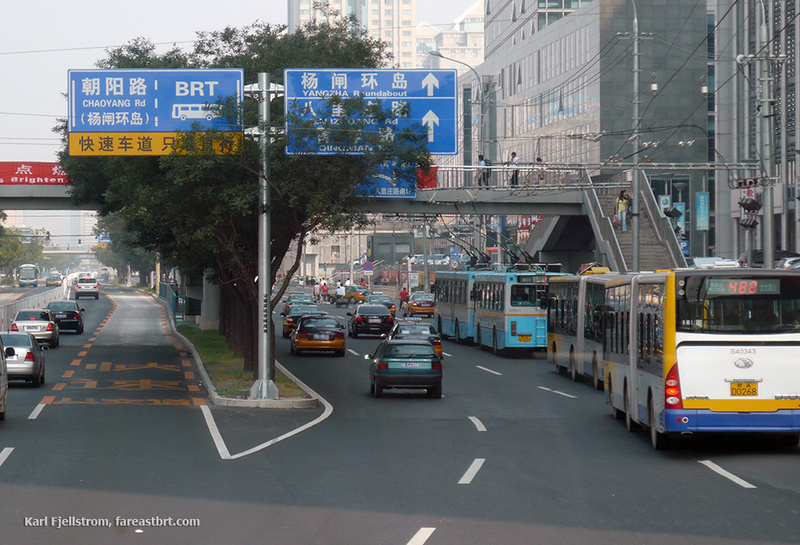 Risk in BRT projects is usually poorly understood, especially by those involved. 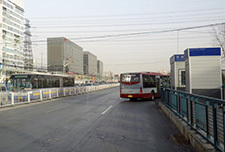 BRT project failures are entirely predictable and can be seen in the project design stage, but the officials and project proponents involved, who often had to overcome great barriers to get the project to the stage of implementation, can be blinkered by misplaced confidence in the design team. This problem is especially acute where the design team is from a big-name consultant firm and is expert mainly at projecting a false confidence. The most blinkered to risk are often those closest to the planning and design process. 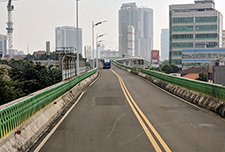 Cases such as the Hanoi BRT illustrate how risk is created in the early stages and propagated through the planning and design process, all the way to BRT project implementation. 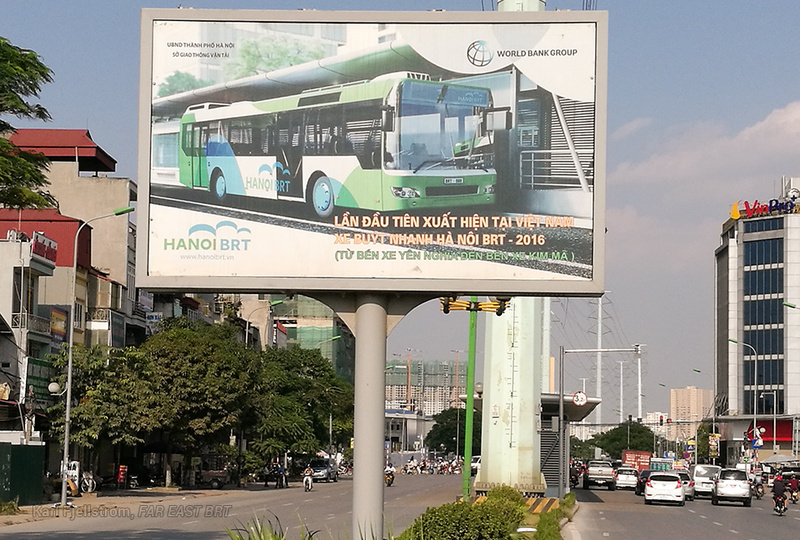 In Hanoi, the World Bank spent a decade and millions of dollars on BRT project planning and design, and awarded multi-million dollar supervision contracts, all involving high-profile international firms. 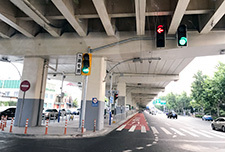 Yet as documented in a separate article, the Hanoi BRT is one of the most poorly planned and designed BRT systems in Asia. 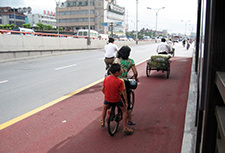 Furthermore, the results of the Hanoi BRT were predictable. 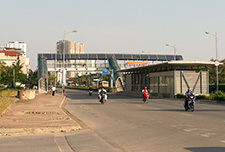 Far East Mobility visited the Hanoi BRT in October 2016, six weeks prior to the opening of the system, and explained that the project would fail because the planning and design was deeply flawed, advising the project proponents to switch immediately to damage-control mode and postpone the opening of the system until some of the worst deficiencies could be mitigated. The government officials in attendance were concerned, but this was not what the World Bank wanted to hear. Discussion was cut off, with the warnings unheeded by the World Bank project manager and senior Southeast Asia division representatives in attendance, none of whom had any direct experience with BRT implementation. 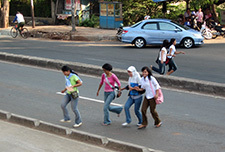 If ever there was a case of consultants needing to advise clients that a change of course was necessary in order to avert a very poor outcome, surely this was it, but the World Bank's consultants doing BRT planning in Ho Chi Minh City instead emphasized that what was needed was a positive attitude and willingness to experiment. Officials and project proponents [...] can be blinkered by misplaced confidence in the design team. Oblivious to the slow-moving train wreck that the project represented, the World Bank's project manager, who had been saddled with the project by earlier project managers and World Bank BRT advisers who have since moved on to other regions, insisted that the project would succeed, proclaiming with supreme wishful thinking in the national Vietnamese media a couple of weeks prior to the opening of the system that the Hanoi BRT "will prove effective in meeting local commuters’ demand and easing traffic congestion." A World Bank / Hanoi BRT sign on display in the BRT corridor in October 2016, before the system opened. 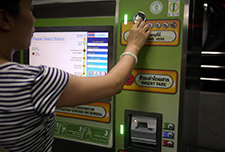 It is doubtful that the sign is still on display after the system has commenced operation. The poor results of the Hanoi BRT have been almost exactly as predicted by Far East Mobility prior to the system opening. Even before the parallel metro line opens at the end of 2018 and decimates the BRT demand, the system has a peak hour ridership of only 520 passengers per hour per direction. 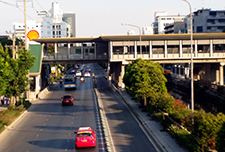 One transportation expert commented in July after visiting the Hanoi BRT that his initial impression was that usage was so low that he wasn't even sure that the system was actually in operation. Officials have apparently given up on the futile and unpopular task of enforcing the exclusive BRT lanes. The individual consultants, international firms, and World Bank project managers & in-house BRT experts can downplay their involvement and responsibility, blame the locals for the many project shortcomings, airbrush the project from their CVs, and move on largely unscathed to work on BRT planning in other cities, while the local officials and stakeholders are left to deal with the messy aftermath. The traveling public pays the ultimate price indirectly through the missed opportunity that the poorly planned BRT system represents, and directly through travel time increases, reduced accessibility and other disbenefits. The experience of Hanoi in BRT planning and design is unfortunately far from unique. Like a bad peak-hour commute, each BRT failure is a unique experience, but there is one recurring feature across all of the failed and poorly-performing systems: poor BRT planning and design, usually from the conceptual and preliminary design stages. Following is a list of BRT systems regarded as either failed or poorly performing, and a summary of the reasons why the systems did not meet expectations. 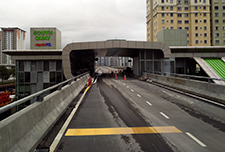 The Kuala Lumpur Sunway BRT fails to provide a physical connection for buses to access the Federal Highway. The system has a flawed corridor, operational concept, and station design as well as errors in the roadway curvature, and is difficult or impossible to fix. 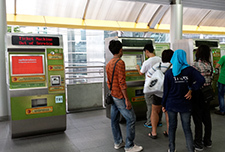 Using passenger throughput as the measure, Kuala Lumpur's BRT is the lowest performing BRT in the world, with just 400 passengers per hour in a single direction. 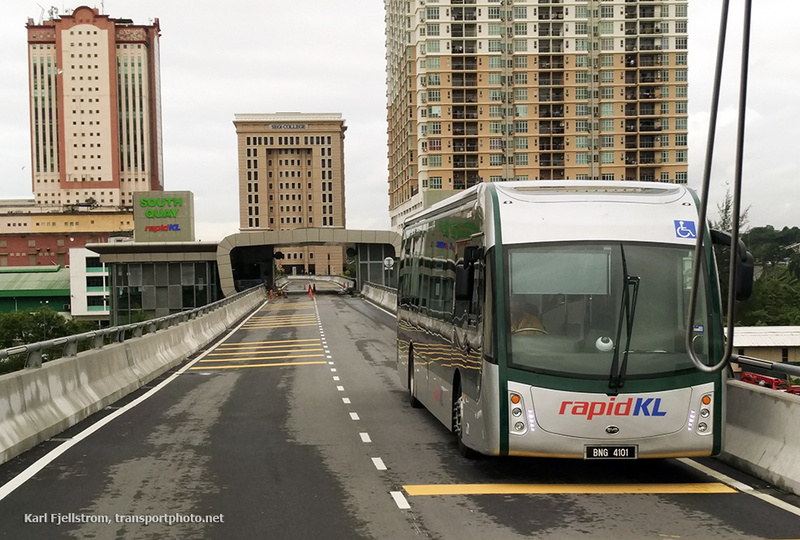 Kuala Lumpur's BRT system has a very high cost, a dedicated electric bus fleet, virtually no passengers, and is fully elevated without any signals, but design deficiencies mean the operational speed is still only 21km/hr. 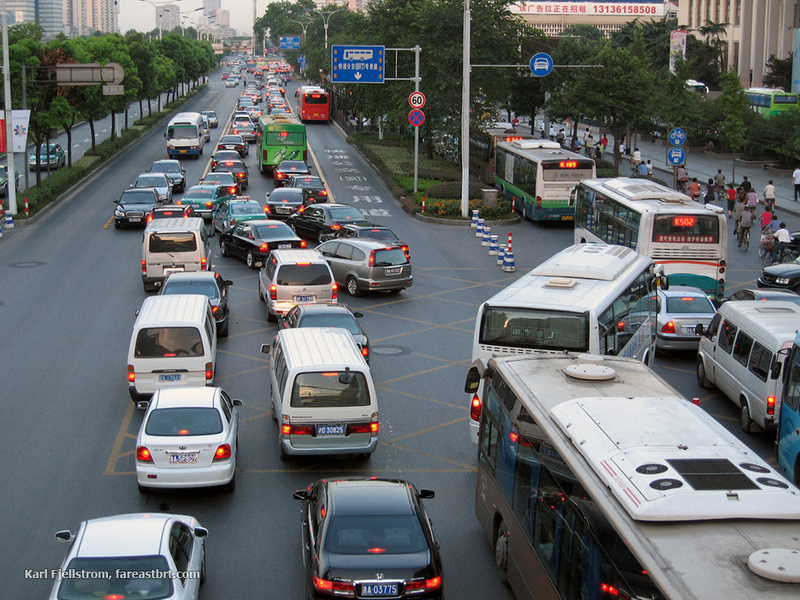 Poor corridor selection is one of the most immediate risk factors in a BRT project. A low demand corridor in a peripheral location which provides no connections to higher demand areas is unlikely to be a success, regardless of the quality of the later planning and design work. 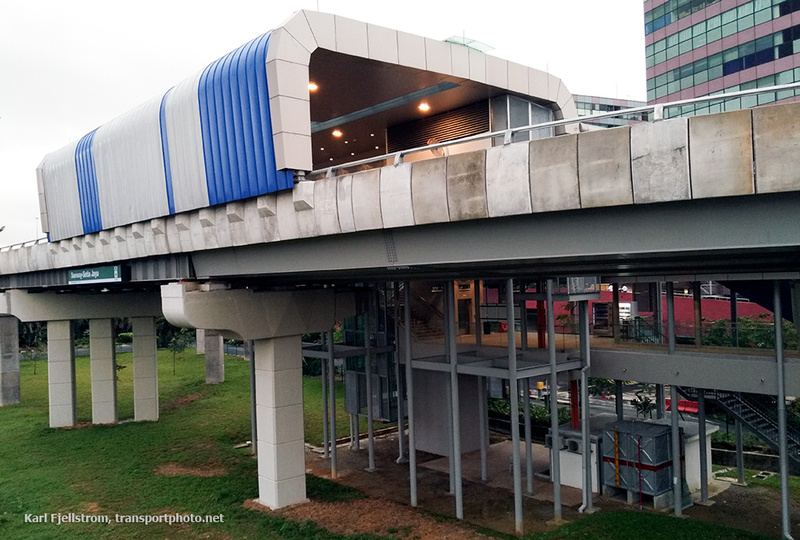 One of many things that went wrong in Kuala Lumpur's Sunway BRT was that the selected corridor was not viable. 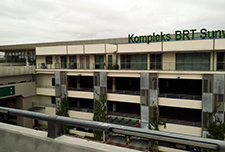 The corridor is in a peripheral, low demand location, and this error is compounded by the fact that the corridor provides no physical connection to the adjacent Federal Highway. Therefore even if the system operators and regulators recognized their error and sought to run services into the higher demand Federal Highway, which connects to the central area, they would be physically unable to do so. 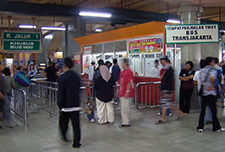 Kuala Lumpur's Sunway BRT is the lowest capacity BRT system in the region and probably the world in terms of actual passenger throughput. In the table of reasons why BRT projects failed or performed far below expectations, though, it is striking that of the systems in China, only Guiyang and Chongqing have performed poorly or failed due to corridor selection issues. Most of the poorly performing BRT corridors have excellent corridors accessing the city center, and the failures can be attributed to other factors. It is also clear that in cases where corridor selection was a factor in poor performance or failure, other factors also came into play, such that the shortcomings cannot be attributed to corridor selection alone. It is especially important to start with a sound BRT conceptual design, because in virtually all cases of failed BRT projects, the failure was set up by key paramaters established during the early planning and design phases. While a poor BRT corridor selection can consign a project to virtually certain failure or poor performance, having a good corridor selection also comes with its own risk factors. Risk is heightened for the obvious reason that a central, high demand location, which is usually a key factor in good corridor selection, will likely have potential negative traffic impacts and a high level of visibility. In these cases the design and planning deficiencies will be painfully on display. This is the case in Hangzhou, Urumqi, Jakarta, Shanghai and Hanoi, and to a somewhat lesser extent in Beijing, Hefei and Jinan. Kuala Lumpur and Nagoya have very poor corridor selection and performance but are largely invisible to the travelling public. On the other hand, risk can in some senses be mitigated in that access to a high demand area can ensure a reasonable level of passenger ridership, masking other design and planning deficiencies. The best way to mitigate these risks is to ensure that the design and planning team have successful experience with BRT implementation elsewhere. It is especially important to start with a sound BRT conceptual design, because in virtually all the cases of failed BRT projects, the failure was set up by key paramaters established during the early planning and design phases. 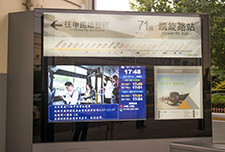 Shanghai's 'route 71 bus lane' has all the features of BRT except for pre-board fare collection. 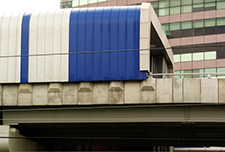 Most of the BRT stations are built under an elevated roadway. Unfortunately, the results in Shanghai have been disappointing. For such a major corridor, throughput is very low at 2,820 pphpd, and speeds are also low. 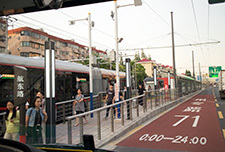 Shanghai's BRT, though not actually referred to as BRT, has all of the features of BRT apart from pre-board fare collection, and the cost of implementation was reportedly very high. It features excellent city centre access and a fleet of dedicated left-door buses. Unfortunately the system started with an incorrect operational concept and this was compounded by later errors in planning and design. The result is disappointing, with only 2,820 passengers per hour per direction on such a major, high demand roadway. Perhaps even more disappointing is that despite the low demand and segregated bus lanes, operational speeds are also low, at only 16km/hr. It should be noted that infrastructure risks are the most serious, because it is often difficult or impossible to fix these problems, short of demolishing the system. 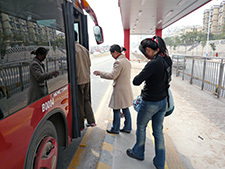 BRT systems fully or partially demolished in the region include Chongqing and Delhi. Other systems are likely to follow over the next decade. Where the station configuration or placement is wrong, as is the case in many cities, system planners are hamstrung by station capacity limitations and cannot overcome low demand by shifting more buses into the BRT. 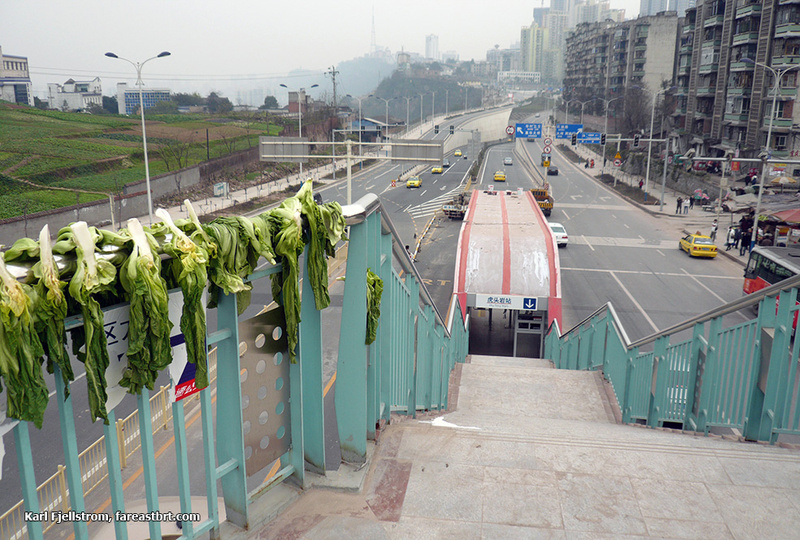 Chongqing's BRT bridges were used by adjacent farmers to dry produce. The 'C' shaped BRT corridor was poorly conceived in all aspects, and had very low ridership. 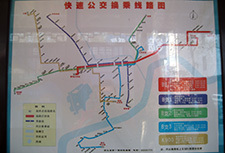 The Chongqing BRT system was demolished in 2012. While the project-shaping risks are in the conceptual and preliminary design stages, there are also major risks in the engineering design, construction, and operation stages. BRT planners and officials cannot simply assume that contractors will correctly follow designs. 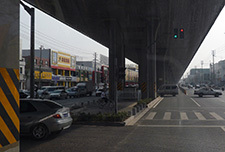 Construction contractors along the BRT corridor in Guangzhou failed to raise many of the minor intersections and driveways in accordance with the design, resulting in interruptions to walkways that persist to this day. 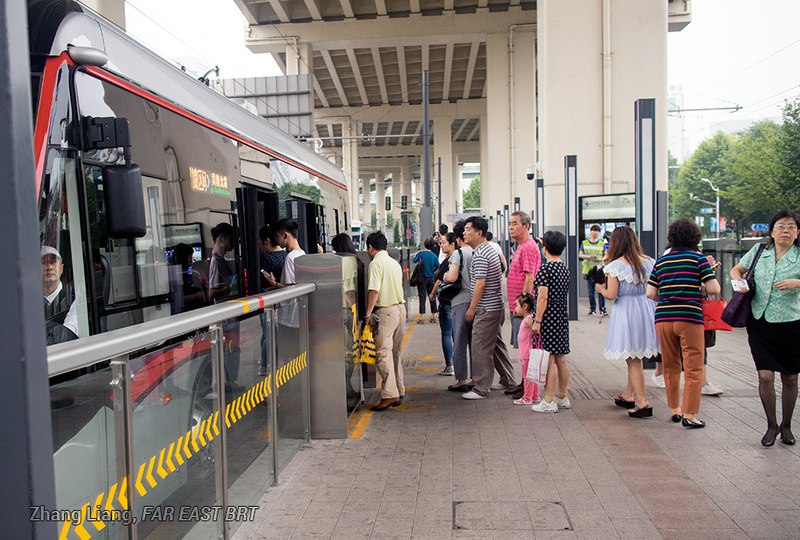 In theory, problems can be fixed after the BRT commences operation; in practice in Guangzhou and other cities problems are usually not fixed, especially if the systems are already considered successful. It is therefore very important to try to address problems and issues as early as possible in the planning and construction stages. Risks in construction mostly relate to the need for technical supervision to ensure that contractors implement the project and build the BRT stations and roadways correctly. 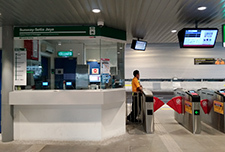 Capacity building and establishment of regular maintenance and cleaning protocols is also necessary to ensure the BRT stations remain in good working order. Construction risks also arise through project timetables that do not allow for timely input by BRT station architectural experts, especially where the BRT station architecture is being led by a local architect who does not have experience with BRT station construction. This can lead to issues such as downpipes being wrongly located, use of exposed materials that are insufficiently robust, or many other issues that while not causing the station to fail to fulfil its function, result in less impressive stations and performance. This risk can be greatly mitigated by ensuring that a BRT supervision contract has a duration long enough to cover the entire planning, engineering design and construction period. As a risk mitigation measure it is generally preferable to have at least two or three BRT operators. Risks in operation are difficult for the BRT project planning and design team to control, but need to be anticipated as much as possible. 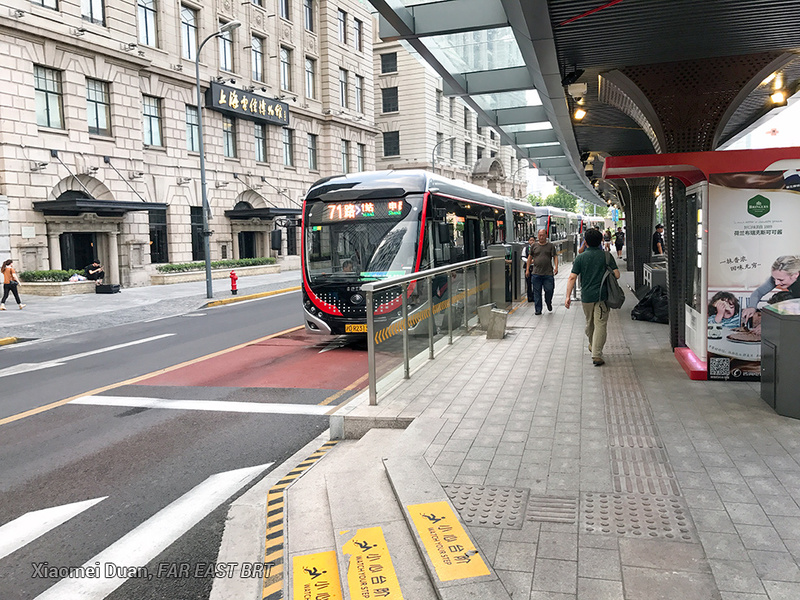 Operational risks, even where the BRT infrastructure and institutional and regulatory arrangements were excellent, are illustrated in the recent experience in Guangzhou. 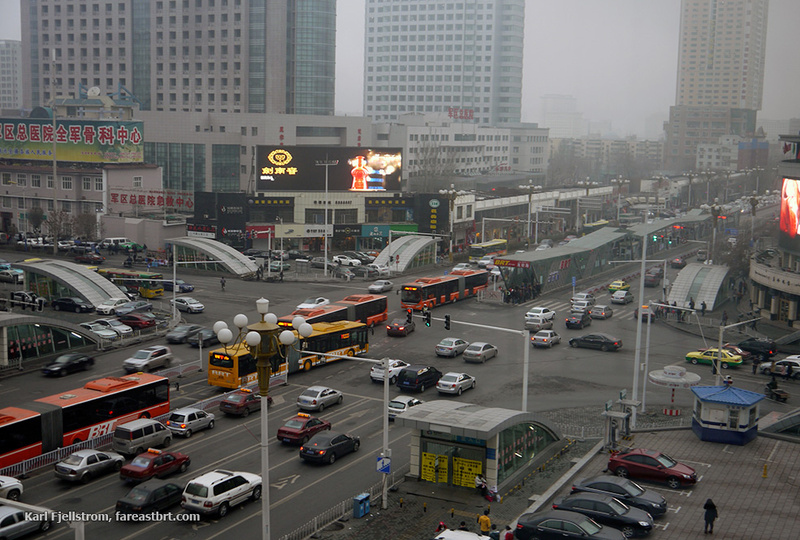 In cities where there is only one BRT operator, which includes all of the BRT systems in China apart from Guangzhou, these risks are magnified. Having only one BRT operator has some advantages during the planning and design stages, as the fare collection and revenue distribution models are greatly simplified, and the sole operator is strongly incentivized to cooperate and share data with the BRT planning team. Having a single BRT operator also largely removes the need for capacity building for the government agency that should plan and control the system, because the planning and control functions are ceded to the sole BRT operator. However, these advantages come at a major cost; namely that the government is at the mercy of the BRT operator and has very little leverage in controlling the operator if the BRT service is unsatisfactory. As a risk mitigation measure it is generally preferable to have at least two or three BRT operators, even though this imposes additional costs and complexities during planning and in developing later contracting and revenue distribution models. 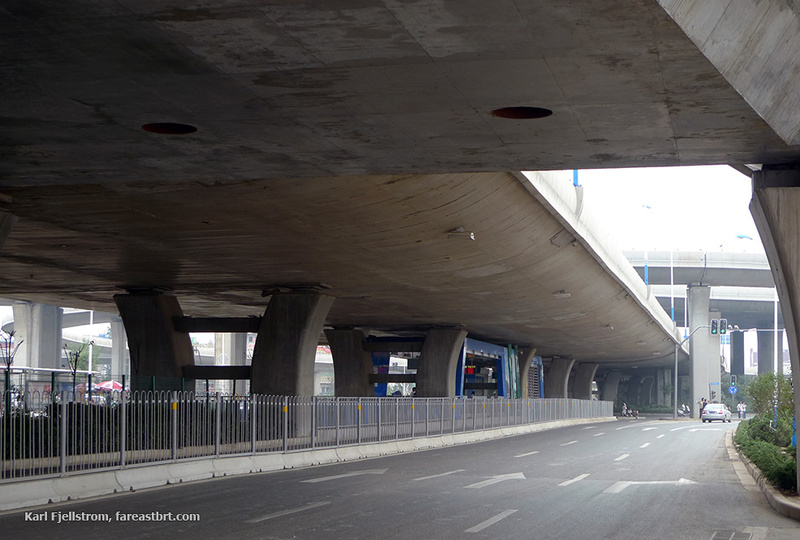 With large sections built under massive new elevated roads, Jinan's BRT faced challenges in attracting passengers. 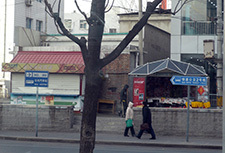 Later corridors in Jinan have tended to follow the same model. A risk factor in Jinan which has also been observed in other cities was that with only a single operator, the government has limited leverage to force the operator to make changes. The following measures are proposed in order to minimize risks. Key project paramaters are established in the preliminary or conceptual design stage. Errors in early stages are often propagated through later stages. A flawed foundation will prevent a project from being successful. Perhaps counter-intuitively, a lower capacity or BRT-lite approach to BRT may be significantly riskier than a bolder, 'full-BRT' approach. 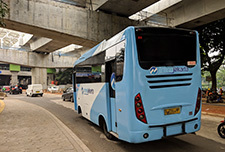 Where the political support or financing is not available, rather than compromising on key features of the BRT system such as median alignment, segregated lanes, pre-board fare collection and high quality stations, it may be preferable not to do BRT at all, and to focus on more modest bus system upgrades instead. 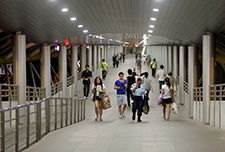 It is not possible to generalise, though, because as the cases of Kuala Lumpur, Bangkok, Guiyang and others show, high cost and high quality station construction and even BRT-only elevated roadways do not by themselves guarantee project success, and lower cost systems such as the median bus lanes in Seoul and the BRT system in Istanbul can deliver significant benefits. 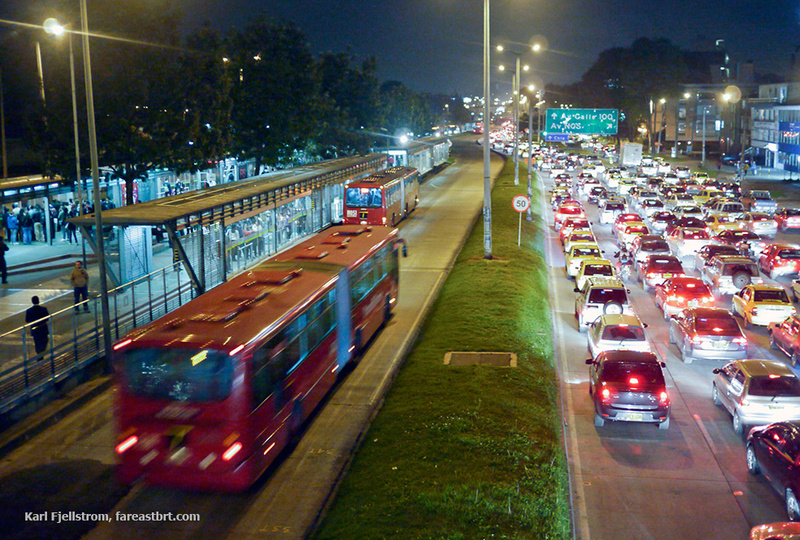 There are always multi-month and often longer periods in BRT projects when things are not moving. Delays can take place due to political factors, usually when high level political support is insufficient to overcome the many barriers that emerge during a BRT project. 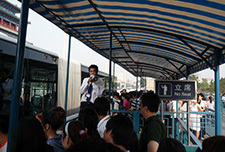 An example is the delays in 2006 and 2007 documented in our Guangzhou BRT overview. Delays also always take place due to procedural factors, such as bidding and procurement, EIA, review and approval steps, and so on. These delays can take several months even where political support is strong. For the BRT planning and design team, these delays are an excellent opportunity to continue with the BRT planning, but can only be taken advantage of if the planning and design team is under contract. Another important reason to have longer term contracts in place is to ensure continuity among the technical team in a situation where counterpart government personnel will often change, noting that a BRT project takes at least three years to implement. In most settings it will be preferable for a national rather than international engineering design firm to carry out the engineering design. In all situations it will be essential to have an international expert team providing ongoing input and technical supervision throughout the engineering design and construction stages, noting that much of the BRT work will proceed in parallel. (For example, the final operational design should usually be completed during the period when the BRT is under construction, along with the bulk of the regulatory and institutional inputs.) The best combination is for a strong national engineering design firm under the main engineering design contract, with a separate, smaller contract for BRT planning and technical supervision by a smaller team of international experts. This approach will maximize the chances of getting a strong team in the two distinct areas of engineering design and BRT planning/design. A far better approach with a higher likelihood of getting the best local and international input is to contract the engineering design and the BRT planning/technical supervision tasks separately. 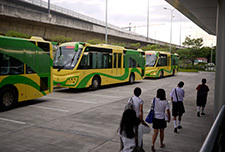 Major regional cities including Metro Manila and Vientiane have recently proceeded with BRT planning with one large contract combining all of the international and national inputs as well as engineering design and technical supervision into one contract. This is in our view a higher risk approach, because it tends to favour larger firms without specialist BRT expertise who can cover all of the long list of positions inevitably required to cover both the engineering design and BRT planning, and it necessitates the formation of a cobbled-together team that has no track record working together. Conversely this approach means that the best and most suitable local firms may not be able to win because their competitiveness is reliant on BRT planning expertise which they do not have and should not need. (This approach is even more sub-optimal where other projects such as parking or NMT are also bundled into the same package.) A better, lower risk approach with a higher likelihood of getting the best local and international input is to contract the engineering design and the BRT planning/technical supervision tasks separately. Another important reason for unbundling the BRT planning and supervision tasks is that the work of the BRT planning team should be of a longer duration, ideally starting well before the engineering design stage and continuing through all the construction and testing stages up to the first six months or so of BRT operation. 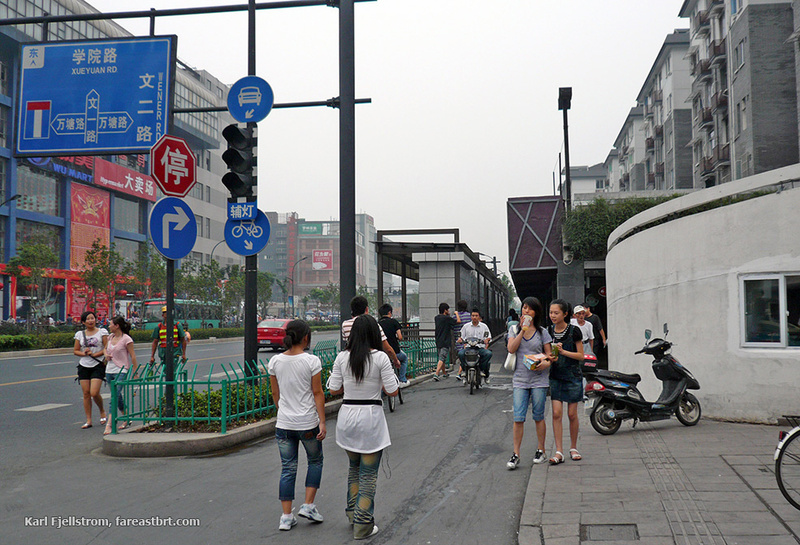 The ADB's approach in Yichang is a good example of how a 'horses for courses' approach to BRT planning can result in much stronger teams than where everything is bundled together. 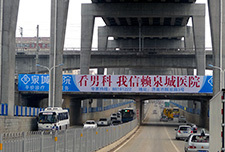 The Yichang project had two main components, a peripheral outer road and a central BRT project. These projects were split in the initial project set-up and in the planning, design and implementation stages into separate BRT and road projects. 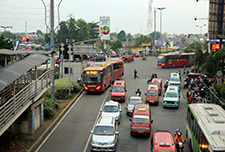 This probably required extra work on the part of the ADB project manager, but if the components had been combined, the BRT planning component would likely have ended up with a larger firm able to take on both projects, but without the specialized BRT expertise required to ensure a successful BRT project. Time spent on a more detailed concept and preliminary design is not wasted, because this work will save time at later stages. There are many variables and approaches that can be taken to corridors, services, stations, intersections, vehicles, modal integration and other BRT system features, and the BRT design and planning team is never going to arrive at the best solution upon the first attempt. In addition, feedback from stakeholders will often require the design and planning team to revise and reconsider key aspects of the project. Risk can be greatly reduced by providing sufficient time and budget for the BRT planning team to reconsider and revise aspects of the project as needed. Thus while a BRT concept design can in some cases be completed in as little as four to six months, a time frame of six to eight months is preferable if the time is available. Note that time spent on a more detailed concept and preliminary design is not wasted, because this work will save time at later stages. A related point is that BRT concept and preliminary stages should not be padded with unnecessary tasks. A lot of follow-up analysis can be done after political buy-in is achieved, and some tasks can be delayed to even after the commencement of construction. If the preliminary and conceptual design stages are padded with every conceivable environmental, social, economic and operational task that a project officer can think of, the result is an impractical TOR that is difficult or impossible to achieve, and more critically that dilutes and diverts attention from where it is most needed. This kind of laundry list TOR filled with extraneous tasks is unfortunately quite common, and the time pressure associated with it means that there is little or no chance for refinement and revision to the BRT plans and designs. This approach also prevents the consultant team from focusing in more depth on particular local issues of concern which may arise, whether relating to traffic impacts, station access, treatment of a sensitive downtown area, or other aspects. 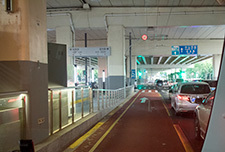 In the earlier project planning stages the focus should be on the core aspects of BRT planning and design relating to data collection, corridor selection, infrastructure, operations and management, and needs to include related issues such as traffic impacts which are always a high priority for city officials deciding whether or not to proceed with BRT. Simulations and renderings should be prepared so that policy-makers can visualize the system. While the replication of BRT corridors is unpredictable (some very successful BRT corridors have no progeny, while some mediocre corridors are rapidly expanded citywide), in virtually all cases the DNA of the first 'parent' corridor finds expression in later 'offspring' corridors. The risks discussed in this article, often flowing from a poorly conceived or vague preliminary BRT plan, unfortunately do not stop with the first corridor and on the contrary are often replicated in later corridors. 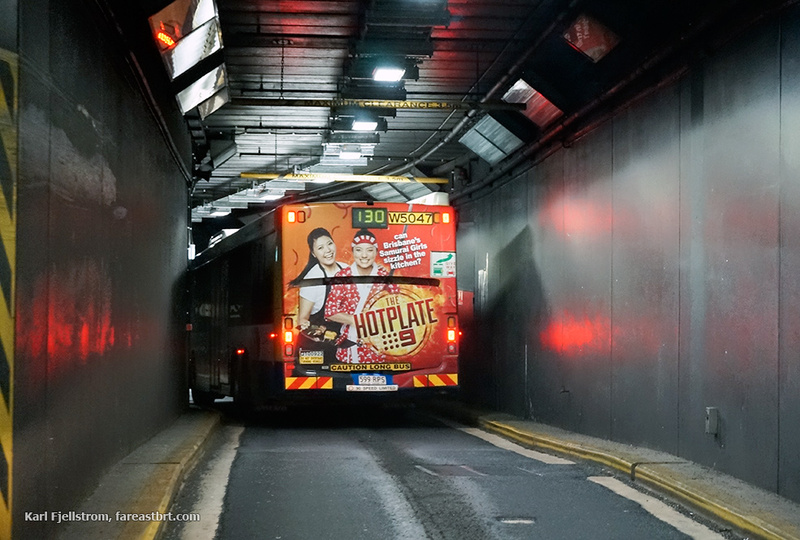 There are many examples of where a poorly planned first corridor is replicated in later corridors at either the same or an even lower level of quality and performance. To name just a handful this includes Jakarta, Beijing, Jinan, Hangzhou and Urumqi, all of which have multi-corridor networks. 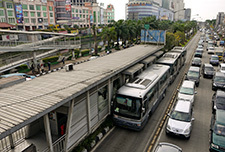 Even in Hanoi, before the realization set in that the system was unworkable, there were optimistic early pronouncements that the same form of BRT would soon be rolled out to additional corridors. While the risk associated with the first BRT corridor is magnified given the likely impacts on any subsequent corridors, the reverse is also true, namely that a good first BRT corridor will establish the template for later corridors to also be successful. These considerations raise the stakes for a successful first BRT corridor even further. 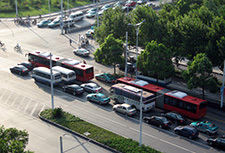 Hangzhou's BRT: bus passengers and car users are stuck in much worse congestion, while a low capacity BRT lane benefits BRT users. 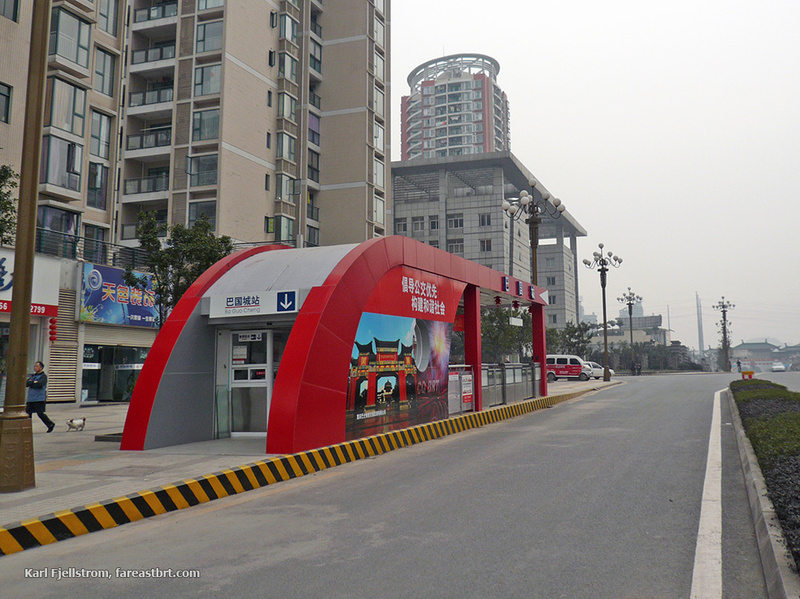 After starting poorly, Hangzhou's BRT has gone downhill, with kerbside stations benefiting only car users who are unobstructed in the central lanes. 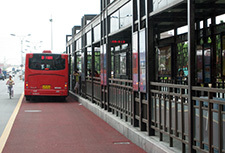 Few cities have been able to improve upon poor first BRT corridors. 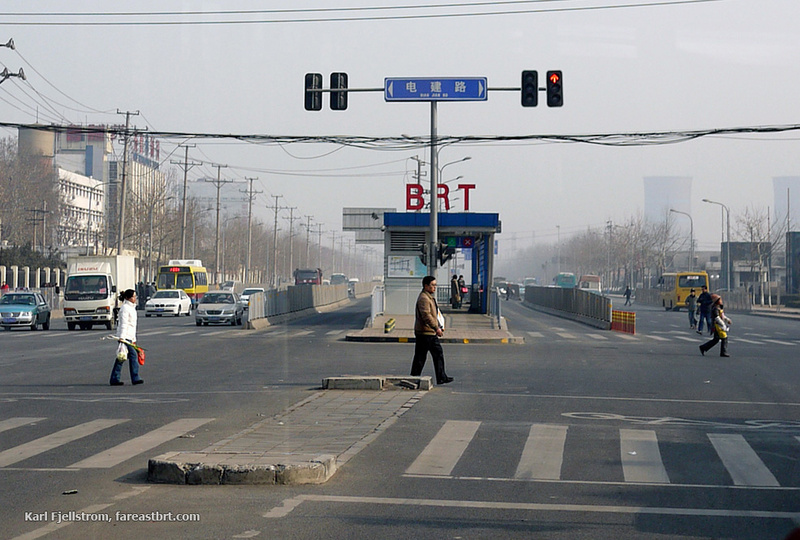 Beijing's first BRT corridor had a low capacity design, and no real operational plan. 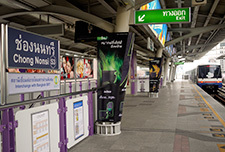 Stations have poor accessibility and most passengers are forced to transfer at the terminal stations. 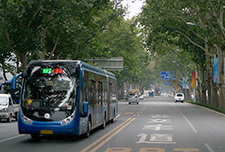 Later corridors in Beijing have a similar design and operational approach, and perform poorly, leaving the majority of bus passengers in worse congestion than before the BRT was implemented. A core BRT unit consisting of personnel from related regulatory and other agencies should be set up fairly early in the project, ideally before the project parameters are all decided upon and announced to the public. One of the important early tasks of this team is to absorb the capacity building inputs of the consultants, and to manage the early project media and other communications. The initial team can be just a handful of people, and the team can be expanded as the project progresses. The selection of consultants trumps all of the above considerations. The wrong team will in the best case and most common scenario result in wasted time and money, but at least nothing will be actually implemented. This is very common. Many cities around the region have BRT plans and designs that were vague, unviable, poorly conceived, and fortunately never implemented. Some cities have multiple such studies. People who are deeply involved in the project, especially local officials and stakeholders who have been promoting BRT, are understandably disappointed when a project is not implemented, but having no project at all is ultimately far preferable to having a failed BRT project. The World Bank's experience in Hanoi illustrates the overriding importance of having the right planning and design team in place. Ironically given the very poor results, the Hanoi BRT had a sound contractual structure in place for the BRT planning, with large, multi-year inputs and separate BRT technical supervision contracts. Clearly, having the right approach to contracting will not compensate for hiring the wrong team and experts involved in the project. Far more important than the firm name is the experience of the experts in the team. 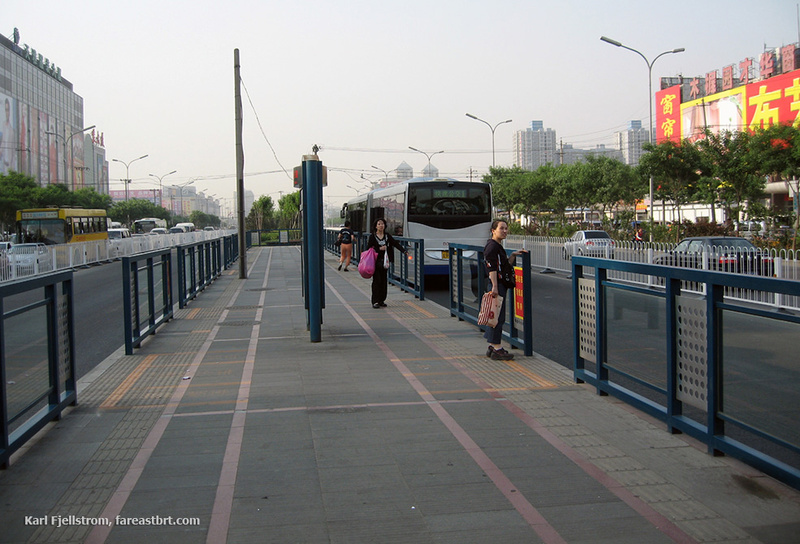 Urumqi's BRT has long stations, but no overtaking lanes, making the substops non-functional. Operating speeds are very low, at only 13km/hr. Station access in some corridors is extremely inconvenient. 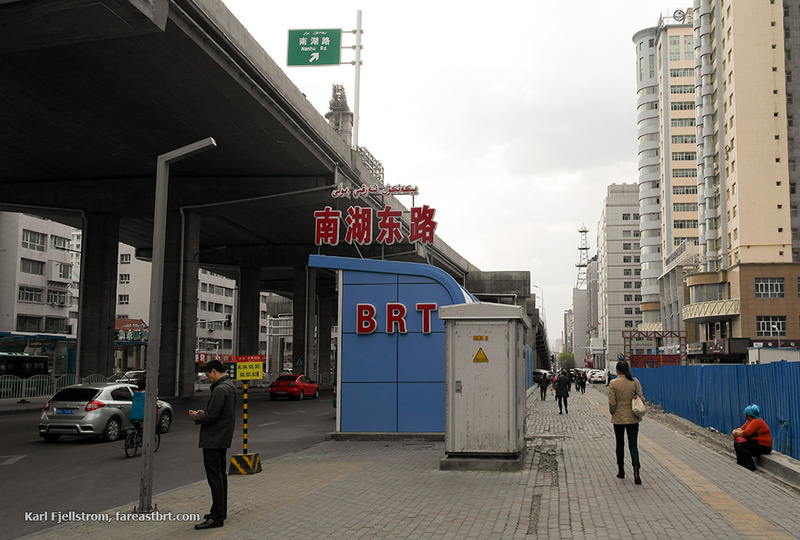 Despite the poor performance of the initial BRT corridors in Urumqi, the BRT system has been expanded to multiple corridors partly out of security concerns, including kerbside stations under an elevated road.